So where exactly is Scotland’s sunshine coast? It’s a bold claim! You thought it was never sunny here? It's simple. Mostly Scotland’s prevailing winds come from the south-west, off the Atlantic. So-o, what area lies beyond, to the north-east of the mountains, notably the Cairngorms, making it sheltered, drier and sunnier than the average? Answer: Moray. Admittedly, bits of East Lothian and also stretches of Fife (both, note on Scotland’s east side) are fairly dry too, though nearer major centres of population and thus more crowded. But Moray? ‘Up there’ on the shore of the Moray Firth. Well, it’s pretty unspoilt, down by the sea. And dry. The little resort town of Lossiemouth, for instance, has 672.7mm of rain per year. (That’s 26.5 inches in old money.) Average for the whole of Scotland is 1571mm (61.8 inches). The Met Office says so. East of Findochty, on the Moray Firth. It’s May and the gorse is out. It smells of coconut. Above the gentle splash of the tide, you can hear the squeaky-scratchy song of whitethroats. Pink thrift is in flower underfoot and there’s some crowberry too (which a friend says ‘smells of mountains’). Lyrical, eh? Anyway, there's more. You’ve got the path to yourself. You’ve nailed the place to get morning coffee...or, no, make that lunch...maybe try our local fish soup called Cullen skink. (One of the best places to eat it is at Bijou By The Sea at Portessie one mile from where this Findochty picture was taken). Now, would you really want to be away in the far west of Scotland on a warm and sunshiny day like that - BEING EATEN ALIVE BY MIDGES? Your call. Looking south over Findhorn Bay. In this pic, the tide is high, there’s a not a lot of sailing activity as it’s a weekday, but there’s a grand sweep of a bay to mess around in if you’re a bit boaty. And there’s a fine and endless beach just a moment from here. Plus nice places for pub meals, drinks, cake, etc - as well as a couple of hotels, B&Bs and cottages. It’s all very pleasant on the sunshine coast. Burghead Bay, looking back towards Findhorn in the distance. 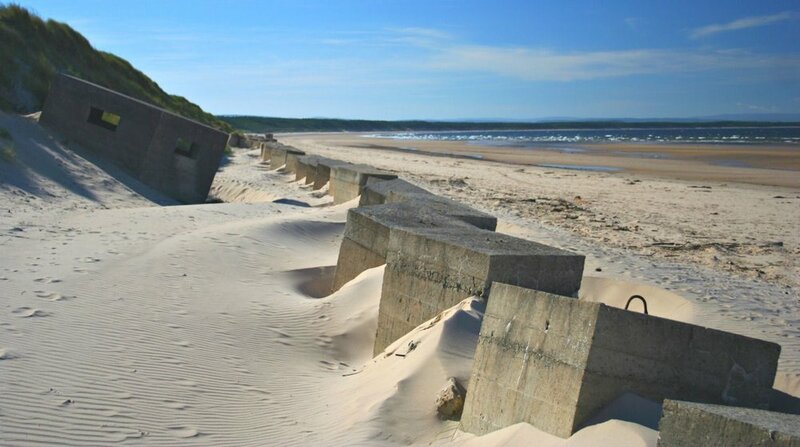 Midway between Findhorn and Burghead, note a couple of characteristics of Roseisle Beach / Burghead Bay: the trees (Forestry Commission) grow down to the shore and there are extensive WWII defences, as this picture shows. The shoreline hereabouts was considered by the military to resemble a sector of Sword Beach, one the designated beaches for the Normandy Landings of WWII. Hence a variety of rehearsals were carried out all along the coast here, notably by the 79th Armoured Division. Though these exercises were carried out comparatively successfully, it is said that at least five tanks (other sources say eight) were lost during practice launches offshore. The ‘swimming tanks’ were top secret, so reports are scarce - but these Duplex Drive Valentine tanks lie in the waters of Burghead Bay, towards the Findhorn end, with one (at least) a designated war grave. If - instead of driving - you walk east from Findhorn, on the beach or in the forest, after a couple of hours hiking (or less), you will reach the promontory town of Burghead. It’s a ‘planned town’, meaning it was laid out to the local landowner’s improving plan in 1805-9. Unfortunately, in clearing the site, the builders destroyed a large portion of what would otherwise have been Scotland’s largest and probably oldest Pictish Fort, which straddled the headland. Evening sun on the bay, and low tide. The promontory on which the Pictish fort was laid out is now mostly built over by the little town of Burghead. The Burghead Visitor Centre is well worth a look. Discover more at the excellent local heritage centre, housed in an old Coastguard Lookout, right on the tip of the headland. Great for dolphin-watching in the Firth too. (Hey, how come we got this far without mentioning dolphins?) You can grab a snack at the Bothy Bistro in Grant Street. This little town has a lovely shoreline, with beach huts an unusual feature for this part of Scotland. You could treat yourself to an ice cream here and go for a stroll. The beach huts at Hopeman. Fine coastal scenery too - just walk out of shot to the right. And keep walking. Walking eastwards towards Lossiemouth brings you to a more rugged section of the coastline, maybe a kind of 'Dinosaur Coast’ as various fossils are sometimes unearthed here by the local quarry. This chunk of rock lies near the path. It's too big to carry off, so don't even think about it. But you can see other footprints on the Hopeman sandstones on the shore, including evidence of 'tail-drag'. No, really. Lossiemouth - the Antibes of the Moray Firth? Slightly tongue-in-cheek here: (I may or may not delete that heading.) The town of Lossiemouth carries that air of well-scrubbed neatness that former fishing towns have in this area. The harbour is a marina. Big wide beaches roll out east and west. It's even popular with aircraft spotters, as the local fast jet base can be very active. And you can see round the community-owned Covesea Lighthouse. If you want just one gee-whizz fact about the place, the local business association website tells us that 'the dunes in Lossie’s East Beach were made using old railway carriages to protect the seatown from heavy seas'. Before we sweep on eastwards, there’s one more thing abut Lossiemouth. It’s some more evidence for Moray’s pleasant climate and is linked to the story of RAF Lossiemouth, sometimes described as the busiest fast jet airfield in the UK. Captain Eric ‘Winkle’ Brown was the Station Commander in charge 1967-70 and he writes of his time there in his fascinating autobiography ‘Wings on my Sleeve’. He comments especially on the local meteorology, using the expression ‘The Lossie Hole’. (This notion, at time of writing, is yet to appear in local tourism literature, as far as I know). OK, so it’s an overcast day in autumn on the Moray coast. Nonetheless, the sun is lighting up the houses of Lossiemouth, on the horizon, centre. This must be the ‘‘Moray Hole’. He was referring to the way that when cloud cover was a problem, conditions for flyers could often be better around the base on the shores of the Firth. He explains this as the warmth of the Gulf Stream meeting the cold waters of the Caledonian Canal, forcing the air to rise. This happens just offshore. I couldn’t possibly comment on the physics of this - though I prefer to think that it’s the rain-shadow effect of the hills to the south. However, the late Captain Brown flew 487 different types of aircraft in his extraordinary life and I only get the occasional hop as a Ryanair passenger - so he must have known a lot of stuff about weather. Whatever the reason for this phenomenon, Brown insists ‘The famous Lossie Hole was no myth, as many anxious aviators could testify’. The River Spey reaches the sea in a tangle of shingle banks, channels and marsh. Great for birdlife. Ospreys more or less unmissable in summer. Kingston-on-Spey on left. Onwards and east runs the big shingle bank, past Kingston, Spey Bay and towards the wee Buckie satellite of Portgordon. Unusual for the Firth, with its well-kept little ports, this village has a harbour that has an air of having seen better days. But it makes up for it with plenty of places to view seals, which loll about seemingly without a care in their fishy world, indifferent to the onlookers. Ospreys fly down from the River Spey on morning and evening fishing trips. Most visitors don't notice as they are ogling the seals instead. OK, this should convince you that it's a pretty gentle climate in Moray. This is (I think) Yucca schidigera. I photographed it in flower on the grassland above the shingle at Portgordon. It's actually seeding itself and spreading. This yucca's usual home is the Mojave Desert, west of Inverness. A very long way west of Inverness. As for the local centre of Buckie, nobody could say it's picturesque, though the late Victorian houses especially north-west of the centre, into Buckpool, are proper, substantial and solid, with their stonework defying Presbyterian dourness with the occasional flash of decoration. Well worth a stroll if you are interested in vernacular architecture. Buckie's commercial harbour is interesting and on the main street there are proper little shoppies. Visit the local bakers or get some fish and chips. Friendly too. Thanks to various shades of hard-wearing outdoor paint on walls and windows, we soon start to do picturesque again. Here’s where you see the Moray Firth tradition of painting the stonework on older houses. Sometimes even the mortar between the stones is picked out and the result is very distinctive. Findochty harbour - gorse just going over, late May. Findochty comes next, on this eastward review. Pronounce it 'finn-ECH-tae' or the local folk (of which thankfully there are still a few) will laugh and throw stones at you. Only kidding. Good colours here, down by the waterfront. Painted stone, neat and solidly built. Proper houses on the Moray Firth. Oh, and it's sunny as well. Next comes Portknockie, with its funny wee harbour tucked below steep green slopes. The local folk (of which thankfully etc etc) are known as 'Knockers'. But the place is best known for its proximity to the Bow Fiddle Rock. a nice place to stay here is The Victoria Hotel, run by locals with just seven rooms and good home-cooked food. Dog friendly too. The coastal path swings past the Bow Fiddle Rock at Findochty then heads east for Cullen. A very attractive section of walkable coastline. I suppose The Bow Fiddle serves as a Moray Firth icon. This rock formation of sea-eroded quartzite has a variety of explanations for its name, including the obvious one: uhmm, it resembles a fiddle bow. (Then why isn’t it ‘Fiddle Bow Rock’?) I think I may start calling it ‘Whale Tail Rock’. Cullen Bay, with Cullen at the far end. Old railway just visible as level line running in from the right. Great walk - it goes over the Cullen viaducts. Don't know why the local deer are so indifferent to passers-by. Probably because there are passers-by the first place. The Three Kings of Cullen are the names of the sea-stacks just visible top right at the far end of the bay. The Bow Fiddle Rock is OK, but the short stretch of coast between there and the handsome little town of Cullen is pretty special. Or you can have some high level views by using the old railway trackbed that leads over the Cullen viaducts. Cullen is charming. Below is the old higgledy-piggledy picturesque sea-town. Above is the handsome early 19th-century planned town. Oh, and above the viaducts are the ice-cream shop, plus a selection of antique shops, a hardware store (always a good sign! ), cafes, and everything you’d want for a leisurely stroll around. Winter sunlight this time - and a view of the edge of Cullen sea-town and the viaduct/walkway that give such great views. Portknockie on skyline. The old seatown of Cullen dates from the 1820s, just after the harbour pier by Thomas Telford was built. The series of viaducts to the south were built by the Great North of Scotland Railway in 1886. Today the old railway trackbed is a walkway between Cullen and Portknockie. Please note - this print will reach you in a simple white frame and ready to hang. The Three Kings of Cullen are prominent features of the coastal scenery to the west of Cullen. Two of them are lapped by the tides on Cullen beach. Like the Bow Fiddle Rock to the west, these rock formations are of tough quartzite rock - as is the beach sand. Please note - this print will reach you in a simple white frame and ready to hang. 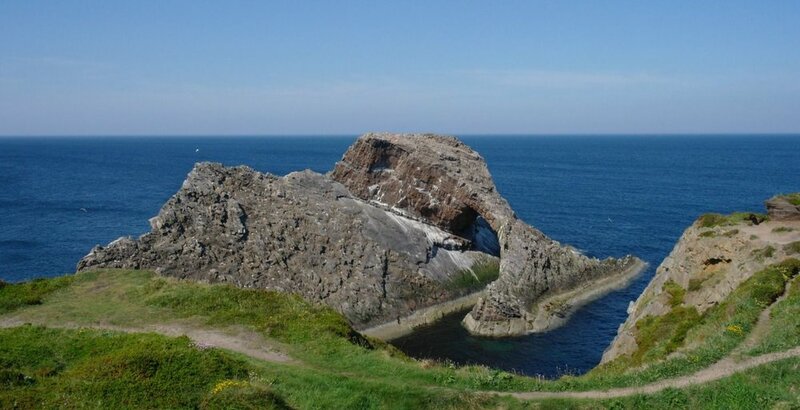 The locally famous landmark of the Bow Fiddle Rock is a kind of icon of the Moray coast. On the eastern edge of Portknockie - and visible from Cullen - the Bow Fiddle is formed of quartzite rock. The sea has eroded it to form a sloping arch offshore. It can be safely viewed from the coastal cliffs and also at sea-level. Please note - this print will reach you in a simple white frame and ready to hang. You know about rain-shadow? It’s applied to an area in the lee of high ground, sheltered from prevailing winds. Basically, rain-bearing clouds dump moisture on the hills before reaching the favoured area beyond. Consequently, that area is drier and milder. I was told | sound like a geography teacher, so I relegated this map to the foot of the page. And I'm sure you're grateful. Is Moray in the Highlands? Where exactly is Moray? Is it part of the Scottish Highlands? Probably. It's got a bit of everything - for instance, it has a superb coastline (with low rainfall). And whisky distilleries galore. And it offers a real Scotland experience. But you have to turn east at Inverness and not west! The Moray Firth dolphins are the biggest bottle-nosed dolphins in the world. Like some of the locals, they have an extra layer of insulating blubber. We describe how likely you are to see these cuddly cetaceans (what?) - and hint at some of the best viewing points.